TORONTO, ONTARIO, December 15, 2017 – The Lexus LS was the luxury car that introduced the world to Lexus, and for 2018 this prestigious flagship sedan is re-invented like never before – combining bold design with intuitive technology and breathtaking performance. The LS series blends a dynamic coupe-like body with the spaciousness of a flagship sedan. 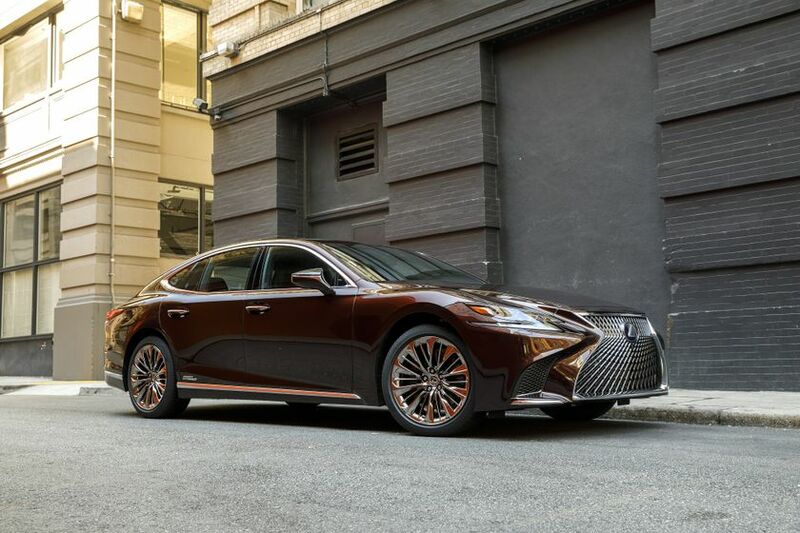 Designers took full advantage of the new Lexus global luxury platform to create a sedan with an impressively sleek silhouette and an aggressive ground-hugging stance. The signature Lexus spindle grille is framed by triple LED headlamps, LED daytime running lights, and pronounced air intakes that enhance engine and brake cooling. Other notable exterior features include LED rear tail lamps, mirrors with integrated LED signal lamps, alloy wheels, a power moon roof, and automatic powered, hands-free opening and closing trunk with easy close feature, and more. Unlock the door, and enter a cabin that is at once sensual and serene as Omotenashi – the Japanese art of hospitality – welcomes you. The LS features a 28-way power adjustable driver’s seat, to ensure every driver enjoys perfect comfort. Three memory settings link the driver’s seat to mirrors and steering column. All seats are heated to provide a relaxing environment for up to five adults. The 2018 LS is longer and offers a longer wheelbase than the 2017 LS that it supersedes, providing even greater legroom for all occupants. Takumi craftspeople have artfully fashioned the interior to delight the senses, with features such as layered herringbone wood trim and ambient lighting reminiscent of Japanese lanterns. The 2018 Lexus LS is a technology showcase, too. New for 2018, the LS now features Lexus Enform, delivering thoughtful connectivity and peace of mind technology in one simple to use package. Enform App Suite 2.0 puts favourite apps at one’s fingertips, and lets drivers bring their music along for the ride, while Enform Safety Connect offers emergency assistance at the press of a button. Other technology features of note include a 24-speaker Mark Levinson Premium Audio System with integrated XM Satellite Radio, SIRI Eyes-Free, Bluetooth connectivity and a 12.3” LCD display, a navigation system with Lexus Remote Touch interface and voice recognition, a 24” head up display, the Smart Key System with Push Button Start, and more. The new LS series provides guests with two exhilarating choices for prestige performance. The LS 500 puts 415 horsepower at the driver’s command courtesy of an all-new twin-turbo V6 – the first in the Lexus line-up – mated to a 10-speed automatic transmission. Incorporating advances gained through F1 racing experience, this combination propels the LS from 0-100 km/h in less than 5 seconds. The LS 500h combines emotional performance with an extra measure of efficiency with the first Lexus multi-stage hybrid powertrain – an advanced hybrid system specifically designed for high-performance luxury vehicles. Targeting class-leading fuel efficiency, this system delivers 354 net system power and can boost the LS 500h from a standing start to 100 km/h in just 5.5 seconds. Both powertrains feature the added all-weather confidence of all-wheel-drive, highly responsive and efficient electric power steering, and finely-tuned suspensions that achieve both the rigidity required for dynamic handling and the ride comfort that is essential in a prestige sedan. The LS also features impressive safety performance. New for 2018, all models feature Enform Safety Connect including automatic collision notification, stolen vehicle locator, emergency assistance button and enhanced roadside assistance. Also new for 2018, all models feature Lexus Safety System +, including the pre-collision system, automatic high beam, dynamic radar cruise control, and lane departure alert with lane keep assist. Other safety features include the Lexus Blind Spot Monitor and Rear Cross Traffic Brake systems, a back-up camera and clearance sonar, rain-sensing wipers, eight airbags, ABS with brake assist and electronic brakeforce distribution, Vehicle Dynamics Integrated Management, Vehicle Stability Control, Traction Control, electric parking brake, a direct tire pressure monitoring system, an onboard first aid kit, and more. The 2018 Lexus LS 500 with F-SPORT Package (Starting MSRP: $1109,300) enhances the LS with unique F SPORT 20” alloy wheels, leather seats and 3-spoke steering wheel. Other upgrades include the Bird’s Eye View Monitor safety technology, a panoramic glass roof, and more. The 2018 Lexus LS 500 with Luxury Package (Starting MSRP: $115,600) enhances the LS with front and rear air suspensions and 20” alloy wheels, additional airbags, rear seat air conditioning, 28-way power adjustable front passenger seat, 22-way power adjustable rear seats, the Bird’s Eye View Monitor, Front Cross Traffic Alert and Lane Trace Assist safety technologies, a panoramic glass roof, and more. The 2018 Lexus LS 500 with Executive Package (Starting MSRP: $129,600) builds on the Luxury Package, adding 20” forged alloy wheels, a dual-screen rear seat Blu-Ray entertainment system, a rear seat power extendable Ottoman, rear seat massage system, touch-free power back door, 120v/100-watt power outlet, the Adaptive Front Lighting safety system, and more. This model may also be enhanced with ornamentation featuring Japanese kiriko style cut glass and other customized features. The hybrid-powered 2018 Lexus LS 500h (Starting MSRP: $134,050) is luxuriously equipped, including a climate control system enhanced with an infrared body temperature sensor system with humidity sensor, soft-touch heater controls, a rear-seat Blu-Ray entertainment system, 28-way power adjustable front passenger seat, 22-way power adjustable rear seats, a rear seat power extendable Ottoman, rear seat massage system, satin plating on interior trim, an aniline/semi-aniline console, synthetic leather instrument panel, wood and leather-wrapped shift knob, touch-free power back door, intuitive parking assist, clearance and backup sensors, a pre-collision seatbelt system with comfort function and auto-extending/retracting buckles, the Lexus obstacle detection system, rear cross traffic alert system, Bird’s Eye View Monitor, 20” forged alloy wheels, adaptive front lighting system, and more. The 2018 Lexus LS series is goes on sale in February 2018 at Lexus Dealers across Canada. For complete and up to date details and specifications, visit www.lexus.ca/ls.